The Dollmenders now offer doll identifications (not appraisals) for an additional fee. Learn your doll’s approximate time period, possible manufacturer, and more. Dollmenders has been providing professional doll restoration since 1994. 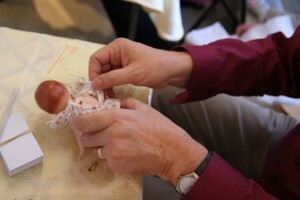 Hundreds of satisfied customers have entrusted us with the task of repairing their treasured dolls. Their expertise includes repair and restoration of antique and modern dolls, including bisque, composition, plastic, vinyl, wood and papier-mâché. Services include eye repair, tooth replacement, hair styling or re-wigging, cleaning or parts replacement. They have a huge inventory of doll parts, if the doll's original part is missing or so badly damaged it cannot be repaired. Minor repairs can be done while you shop. Larger repairs will be taken to the "doll hospital" and returned to The Little Traveler for pick-up.